(Nanowerk News) A new technique makes it possible to quickly detect the presence of drugs or to monitor certain medical conditions using only a single drop of blood or urine, representing a potential tool for clinicians and law enforcement. The technique works by extracting minute quantities of target molecules contained in specimens of blood, urine or other biological fluids, and then testing the sample with a mass spectrometer. Testing carried out with the technology takes minutes, whereas conventional laboratory methods take hours or days to yield results and require a complex sequence of steps, said Zheng Ouyang (pronounced Jung O-Yong), an associate professor in Purdue University's Weldon School of Biomedical Engineering. "We've converted a series of operations into a single extraction process requiring only a pinprick's worth of blood," he said. The method, called "slug flow microextraction," could be used to detect steroids in urine for drug screening in professional sports and might be combined with a miniature mass spectrometer also being commercialized. The combined technologies could bring a new class of compact instruments for medicine and research, Ouyang said. Findings are detailed in a paper appeared online Oct. 5 in the research journal Angewandte Chemie International Edition ("Direct Mass Spectrometry Analysis of Biofluid Samples Using Slug-Flow Microextraction Nano-Electrospray Ionization"). The paper was authored by graduate student Yue Ren, undergraduate student Morgan N. McLuckey, former postdoctoral research associate Jiangjiang Liu and Ouyang. The researchers demonstrated the technique, using it to perform therapeutic-drug monitoring, which has potential applications in drug development and personalized therapy; to monitor enzyme function, as demonstrated for acetylcholinesterase, which is directly related to the symptoms and therapy for Alzheimer's disease; to detect steroids, yielding results in one minute; and to test for illicit drugs. "In the future, for example, parents might be able to test their children's urine for drugs with a simple cartridge they would take to the corner drug store, where a desktop mass spectrometer would provide results in a few minutes," Ouyang said. The technique involves drawing a specimen into a glass capillary that also contains the organic solvent ethyl acetate. Like oil and water, the two fluids are immiscible, and an interface is formed between the specimen and the solvent. Gently rocking the capillary back and forth several times causes small amounts of target molecules in the biological sample to cross this interface into the solvent side without mixing the two fluids. "You don't want to mix these two, you want to extract only the biomarkers you are looking for and leave the junk behind because mass spectrometry is very sensitive to impurities," Ouyang said. Then the solvent containing the biomarkers is subjected to a high-voltage current, ionizing the sample so that it can be analyzed with mass spectrometry. Researchers have used microextraction for other applications. When combined with the miniature mass spectrometer also developed at Purdue the method represents a mobile system for medical professionals, researchers and law enforcement. Mass spectrometry works by turning molecules into ions, or electrically charged versions of themselves, inside the instrument's vacuum chamber. Once ionized, the molecules can be more easily manipulated, detected and analyzed based on their masses. The new approach uses a method called nanoESI – or nano electrospray ionization - in which the ionization step is performed in the air or directly on surfaces and does not require a vacuum chamber. 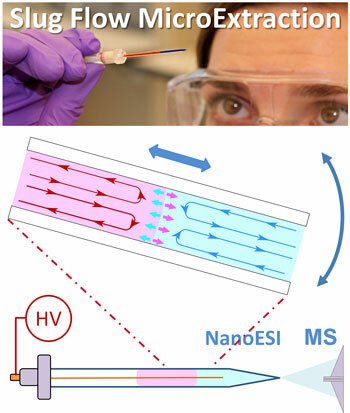 Although the research was conducted using a conventional laboratory mass spectrometer, the same nanoESI operation could be carried out with the new miniature mass spectrometer. Whereas conventional mass spectrometers are bulky instruments that weigh more than 300 pounds, Purdue researchers have recently completed their latest version of the miniature mass spectrometer, the Mini 12, which weighs 40 pounds, is 12.5 inches wide and 16 inches high. "The sampling ionization technologies like slug flow microextraction could make the miniature mass spectrometers perform the actual testing without requiring other equipment for sample treatment," Ouyang said. "This will bring a new class of compact medical instruments." The research has been funded by the National Institutes of Health. The work to develop the miniature mass spectrometer has been supported by the NIH and National Science Foundation and is led by Ouyang and R. Graham Cooks, the Henry Bohn Hass Distinguished Professor of Chemistry in Purdue's College of Science. U.S. patent applications have been filed for the microextraction and miniature mass spectrometry. The technologies may be commercialized through a new company formed after partnership agreements were signed in 2013 by Purdue and Tsinghua University. "The overall goal is to use this technology for developing disposable sample cartridges to work with our mini mass spectrometry system in clinical and especially the point-of-care applications in a doctor's office," Ouyang said.